Next year's firewood is cut, split, stacked and permanently covered beside The Shed, part of the fall ritual, writes columnist Dana Wilde. The oaks are finally dropping their leaves in droves this week. They and the beeches always hold out the longest, and so the end of October is gold and copper here. They’re marcescent trees, and some of their leaves hang on well into snow season and even spring, when the great re-awakening unfolds and the old leaves are evidence that everything’s returning, not spontaneously generating. The red maple beside the driveway burst into flame in mid-month, a couple of weeks later than usual. Every fall it goes up in a great tree conflagration over a week or two, then casts off all its scarlet leaves at once, usually in leaf-stripping wind and rain. Leaf carpets appeared, a week or so late, on lawns up and down Route 9. The birches have dropped leaves at the usual steady pace that started in September and lasts into November, and the deck is disappearing under their brown and yellow litter. The first trees to get naked are the ash trees, in September. Come to think of it, they’re the last to cover up in May, too, which might imply something about their libido. Probably not, that’s arboreal anthropomorphism. Still, they’re beautiful, plain and simple, and apparently needing more sleep than the rest. 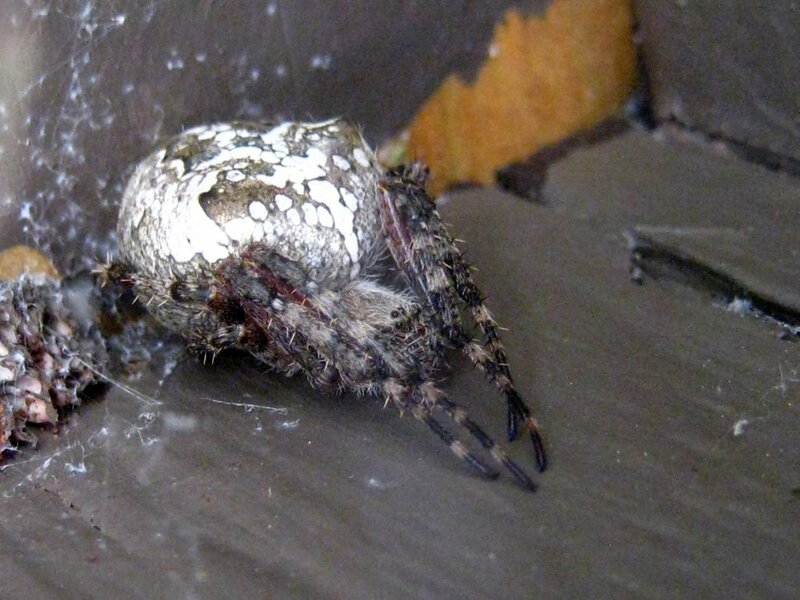 The orb-weaving spider who moved in under the deck rail during August has curled up there and hardly moves any more. The conifer seed bugs are finding their way into the warmth of the house. I toss them out before somebody tries to kill them and causes a piney stink. The birds have been unusually sparse this fall. In some Octobers we fill the feeders twice a day, but this year even the blue jays have shown up only occasionally to pilfer morsels from the cats’ dish. A hundred years ago our clearing on the hillside was a cow pasture, and now it’s enclosed by hefty pines, hemlocks and hardwoods, so our dooryard doesn’t usually harbor a large avian diversity anyway. Mostly chickadees flitting from tree to tree and blue jays bullying them off every perch. A few red-breasted nuthatches have turned up, but squads of mourning doves that often patrol the firs have this fall been absent. A barred owl haunted the woods all summer, asking the other ghosts “Who cooks for you?” all night, but he hasn’t been heard since the eclipse. A few downy woodpeckers. Different sparrows, tufted titmice appearing and disappearing like foreign tourists. Crows overhead. 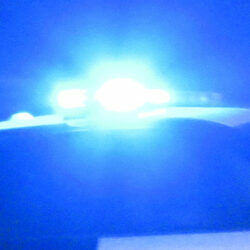 One chilly morning what looked like a bear cub came barreling out of an oak tree and flapped across the driveway. It turned out to be a turkey. A few juncos showed up in mid-October, hopping around on the ground and in the lower branches like tiny horizontal pogo sticks. Normally they blow through for a week or 10 days going south and then again in late March headed north. But this fall there have been just that handful for a day or two at most. Maybe the warm weather in early October encouraged them to forage off the beaten paths. Still, you’d think the ever-slanting sunlight would tell them the tale of imminent cold. We don’t rake leaves because we need all the dirt-making material we can get. So usually I mow them to create a sort of mulch I hope will decompose under melting spring snow and reinforce our ledgy slopes. Next week chopped-up maple, oak and birch leaves will be corrugating the grassy parts of the yard. Next year’s firewood is cut, split, stacked and permanently covered beside The Shed. Life goes on, and the seasons, and everything else. Dana Wilde lives in Troy. 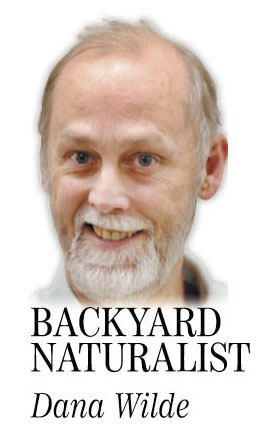 You can contact him at [email protected] Backyard Naturalist appears the second and fourth Thursdays each month.